Young and old, coordinated or not-so-much, nary an American alive today could dislike the classic pastime of miniature golf. 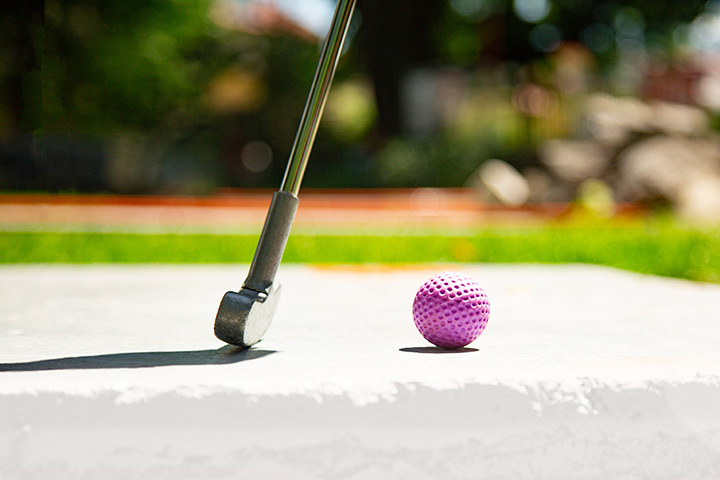 Whether you’re looking to spend some quality, outdoor time with the kids, or find just the perfect spot for a first date, the miniature golf courses of Pennsylvania are a wonderful option! From classic and kitsch to championship-style, these courses are ready and waiting to provide hours of nostalgic fun! Putt U Mini Golf is an incredible option in the Lehigh Valley to get outdoors and have some fun! Two challenging, 18 hole courses, straight forward enough for little ones, and challenging enough for the adults to enjoy as well! Feeling a bit peckish after you activity? Stop by the Boardwalk Bites truck, featuring incredible goodies like deep fried Oreos, funnel cakes, and hand cut fries. Village Greens is certainly one of the most beautiful spots in the Keystone State to enjoy a round or two of mini golf, if not the world. 13 stunning acres of land, flawlessly integrated with two fantastic courses. The orange course draws on more classic mini golf themes, with holes ranging from covered bridge to tobacco shed. The golf course, meanwhile, draws on the diverse natural landscape to present holes more similar to the original iteration of the sport. Take a break from a heated match in the Village Green air conditioned snack bar, or on a delightful outdoor patio. If you want to hit some balls in the ‘Burgh, look no further than Kniess’ Miniature Golf! At this iconic option, generations deep with delighted fans, careful landscaping and delightful themes combine to create one of the best mini golf experiences in state. Open Memorial Day to Labor Day, 11 a.m.-11 p.m. every day. A conveniently located indoor mini golf option in Philadelphia that’s BYOB, could it be? Easily, with Keystone Mini Golf and Arcade. Visit for a fun, climate controlled activity to bust up those gloomy city days, or for an extensive array of classic and contemporary video games. Can’t make it to Kensington? Keystone has two portable holes available to rent, perfect for any social events or the best breakfast meeting ever. Enjoy nostalgic decor, and 13 solid holes. Bear Rock Junction was carefully designed as a wonderland for the whole family, full of friendly competition and joyful details. Choose from two courses, both simultaneously challenging and whimsical, with an option to add the second course to your game for 50 percent off. Take a break from the tee and board the Bear Rock Junction train, a great way to see the sites and enjoy the pleasant weather. Looking for a bit more edge in your activity? Visit on October weekends for glow golf, or to participate in a scavenger-hunt corn maze. Eighteen holes of good old fashioned mini golf fun, conveniently located just a few mile from Penn State. A great place for an affordable party, and be sure to keep an eye on their website for incredible discounts and specials! Eighteen holes, flawlessly integrated into their environment, ready and waiting at Two T’s Mini Golf! The fun needn’t end there, as this Easton location also boasts a driving range, as well as indoor glow-in-the-dark mini golf, complete with some of the most incredible art around. Need a break from golfing? Be sure to check out Two T’s laser tag, and an arcade featuring both classic and modern favorites. A charming course, ideal for families and old fashioned quality time. Even without the added excitement of mini golf, a stroll around these gorgeous grounds would be worth a visit. Don’t forget to visit the snack bar after your game for a scoop or two of ice cream! Truly one of the most beautiful spots in Pennsylvania, with breathtaking vistas and pretty details abound. Enjoy the breeze from the mighty Susquehanna as you try your hand at these 18 holes. Water Golf on City Island draws on classic, championship golf themes for their holes, making it one of the most scenic mini courses around. A great option for kids parties! Twenty-seven classic, themed holes of mini golf. Sunset Golf offers not only classic family recreation, but a driving range, as well as lessons. Great for families, or as a date spot!